» LARGE BACK-LIT DISPLAY SHOWS ALL INFORMATION AT A GLANCE. » FLOW OR PRESSURE BASED REGULATION. » 5-BOOM SECTION SWITCHES PLUS MASTER SHUT OFF SWITCH. » BUILT-IN APPLICATION PLANNING TOOL. » SINGLE CABLE CONNECTION FOR EASY HOOKUP. 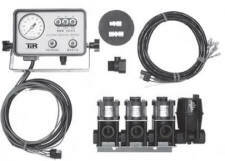 COMPLETE SYSTEM INCLUDES CORE KIT, 1" 801 FLOW METER, AND 1"
REGULATING VALVE. ORDER SPEED SENSOR SEPARATELY. » DEDICATED BUTTON TO SELECT RATE PRESETS. » DUAL BOOM CAPABILITY TO SWITCH TO SECOND SET OF SPRAY TIPS. SPEED FALLS BELLOW A CERTAIN VALUE. FLOW METER, AND 1" REGULATING VALVE. RC-1B SPRAYER CONTROLS ARE DESIGNED TO GIVE THE SPRAYER OPERATOR COMPLETE CONTROL OF PRESSURE AND BOOM SHUT-DOWN FROM THE TRACTOR. QUICK CONNECT HARNESS FOR EASY HOOK-UP TO THE SPRAYER. FEATURES INCLUDE 6 FT. CAB HARNESS, 8 FT. SPRAYER HARNESS, 0-100 PSI GAUGE IN CONSOLE, MASTER SWITCH, 3 BOOM SWITCHS, AND PRESSURE CONTROL VALVE. OPERATES ON ALL 12 VOLT DC SYSTEMS. RC-10N SPRAYER CONTROL IS MAINLY USED TO CONTROL PRESSURE AND LINE SHUT-OFF FROM THE TRACTOR. FOR SMALLER SPRAY APPLICATIONS. 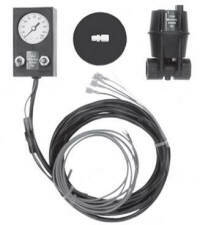 FEATURES INCLUDE CAB HARNESS, 0-100 PSI GAUGE IN CONSOLE, MASTER SWITCH, BOOM SWITCH, AND PRESSURE CONTROL VALVE. OPERATES ON ALL 12 VOLT DC SYSTEMS. USED FOR CONTROLING SPRAYING PRESSURE ON 12 VOLT DRIVEN SPRAY PUMPS FROM REMOTE LOCATION BY CONTROLLING THE SPEED OF THE MOTOR. GREAT FOR SMALL SPRAY RIGS OR FERTILIZER APPLICATIONS.